Admittedly, I am still looking for a great beer dough for pizza. 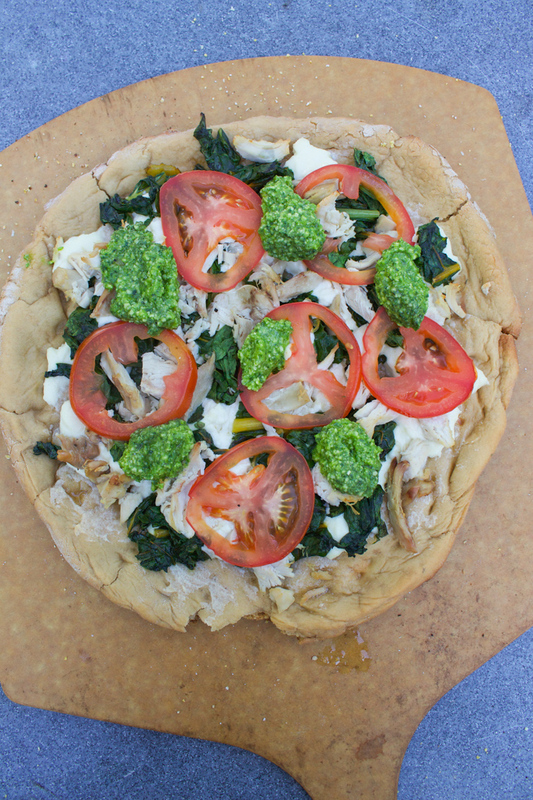 I had a fantastic pizza planned for the week to use homemade ricotta cheese, sauteed swiss chard, leftover roasted chicken, the ripe tomato from the farm, and some homemade swiss chard pesto. The topping pairings were great, but the pizza crust left a lot to be desired. My failure of a dough aside, pizza, with fresh vegetables is a great way to use produce you arent sure what to do with. Pizza be so much much more than just marinara and processed mozzerella cheese. When you top it with healthy ingredients, it can turn into one of those indulgences that isn't all that bad. I suspected, right from the beginning, before I even gave the dough a chance to rise, it would be doomed. It just felt tough. Maybe it was the mixture of whole wheat flour (which worked out amazing for the pasta) that through the recipe off. I was still hopeful, because, even though it wasnt as springy and fluffy as I expected, it did roll out nice and had some potential of being a decent base. I had even used my husbands homemade beer and mixed in fresh rosemary. It smelled amazing. I got the grill fired up to test out our pizza stone for a second time. The first time we used it, we burned our store bought dough, so I was careful to spread out the coals a bit better. Ready and rolled I threw our pizza dough on the heated stone to precook. I always let the dough cook for a few minutes before adding toppings. It cooks much better as it prevents the dough from getting too soggy from all the liquid from the toppings leaching out. Ready to pull the dough off to start adding toppings, I realized we were in trouble - some of the dough was sticking to the stone and wouldnt come off without tearing away from the bottom of the pizza. I was so upset, but kept going. Afterall, no one would see the bottom anyway. First I spread on a layer of homemade ricotta cheese. Next, I layered on some sauted swiss chard and chopped roasted chicken. Finally, I placed on slices of our fresh tomato and placed back on the pizza stone in the grill to finish cooking. The second time around on the grill, I was still having trouble. The bottom was cooking much faster than the rest of the pizza. In fear it would be over cooked on the bottom and raw on top, I pulled the pizza and tranfered it into the oven inside to finish cooking. I had one last finishing touch. I dolloped on some delicious swiss chard pesto. You can make pesto with anytype of green - dont think its just for basil. Really, its all about that intense garlic flavor with the salty pecorino romano. The finish product? The crust, well, just never got the fluffy feeling I wanted it to have. No, it was more so like a cracker. If you like well-done crispy pizza, you would have like it, but it didnt make the cut for me. However, I couldnt help going back for a second "half" slice.... and then a third "half" slice. The toppings were perfect. The ricotta was creamy, the sauteed chard and tomato added the freshness I craved, and the pesto added a salty garlicy bite to the end. Roll out pizza dough to desired thickness (considering it will rise when cooked). Sprinkle some cornmeal on the bottom of the pizza to help prevent sticking to the pizza stone or pan. Drizzle top of pizza with olive oil and place on a pizza stone or pan in a 400 oven or charcoal grill. Partially cook for several minutes (to help prevent pizza from getting soggy after adding toppings). Time will vary significantly depending on type of dough (thin crust vs rising dough). Remove from oven/grill. Spread on ricotta cheese and evenly arrange sauteed chard, chicken and tomato slices. Place back in oven/grill and continue to cook until crust is done (again times will vary). I recommend periodically checking on the pizza. Use spatula to lift pizza and inspect bottom, to ensure its not burning. You can carefully poke the crust, around the edges to check for doneness. If you are unsure, tear off a piece of the crust to make sure dough was cooked through. Remove pizza from heat and let cool and rest for 5 minutes. Dollop on pesto, cut and serve. After indulging on carbs the day before, I wanted to make something leaner and lighter the next. We got some great red leaf lettuce and I knew I wanted to make a salad with some of the fresh strawberries. Honestly, I would have been fine to enjoy the meal sans-meat, but I also have my husband to think about and he had been working up a healthy appetite after a long day of work. Traditionally, I had seen chicken pair with strawberry salads, but I had sirloin tips, with great marbling that needed to be cooked and thought why not steak and strawberries? 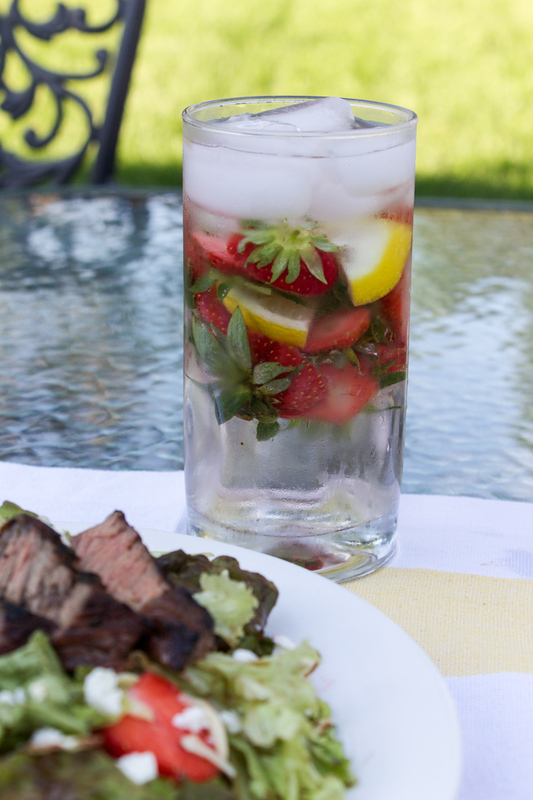 The acidity and sweetness of the strawberries would help cut through the "fattiness" and richness of the steak. I had my husband get the charcoal Weber started, while I through the steak tips in a quick balsamic vinegar and grape seed oil marinade. Id never marinaded anything with balsamic, but knowing it would be the base of the dressing, I thought it would compliment it well. Being a shorter marinade time, I knew it wouldn't impart too much flavor, but the acid would help break down and tenderize the meat. I pre-washed the lettuce the day prior, so mixing up the quick honey-balsamic vinaigrette, and prepping the base of the salad was very easy. All I needed to do was dice up some of the strawberries. Somewhere on Pinterest I saw, what I now think, was a life altering epiphany about strawberry tops. Rather than throwing them away (or composting them). Save them to make infused water! I added a couple slices of lemon to mine. A nice, healthy and refreshing accompaniment to dinner. I took control of the grill, and got the perfect sear on the steak and then moved the tips to indirect heat to finish cooking to a medium rare. While the meat rested I portioned out the salads, topped with some crumbled goat cheese and almond slivers (two great pairings with strawberries). Before serving, I sliced the sirloin, against the grain, into thin bites and placed on top of the salad. Marinade steak tips in mixture of equal parts balsamic vinegar and grape seed oil, salt and pepper (optional). Pre heat grill. While waiting for grill to heat up, mix 2 tbs olive oil, 1 tbs balsamic vinegar and salt and pepper in bowl. Mix with whisk to emulsify. Add salt and pepper to taste. Sear steak tips on hottest part of grill for 1 minute. Flip and grill another minute. Move steak tips to indirect heat on grill and let cook for another 4 minutes or so. Use a thermometer to check for doneness based on preference. I cooked mine to be medium rare to medium. When done, pull off grill and let rest at least 2 minutes before slicing. For salad, toss red leaf lettuce, sliced strawberries, goat cheese and almonds in with vinaigrette. Before serving, thinly slice steak and place on top of salad. I love the simplicity of this recipe and how it allows asparagus, fresh from the farm share, stand out in harmony with a buttery and herbacious lemon sauce. Feel free to use whatever type of pasta you'd like, but I think the wide strands of linguini are the best vehicle for this particular recipe. If you are feeling more daring, I'd suggest making your own pasta. 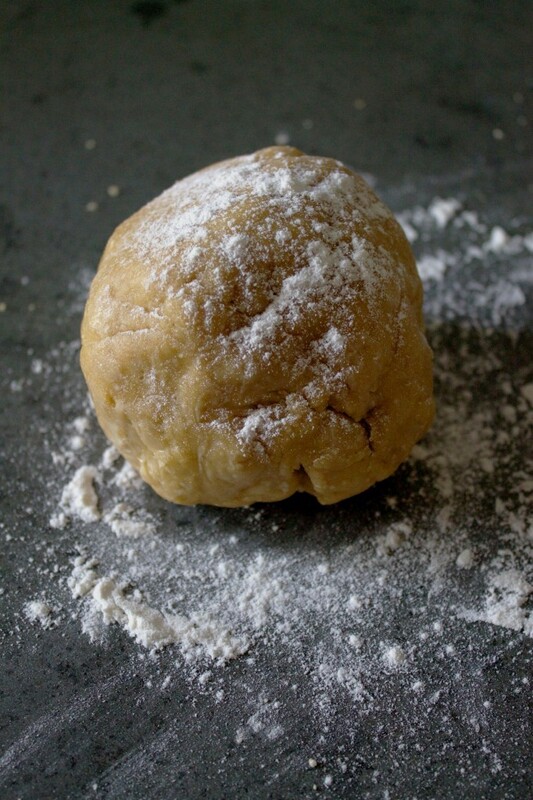 The dough itself, is quite easy (even easier with a food processor, but you can do by hand). 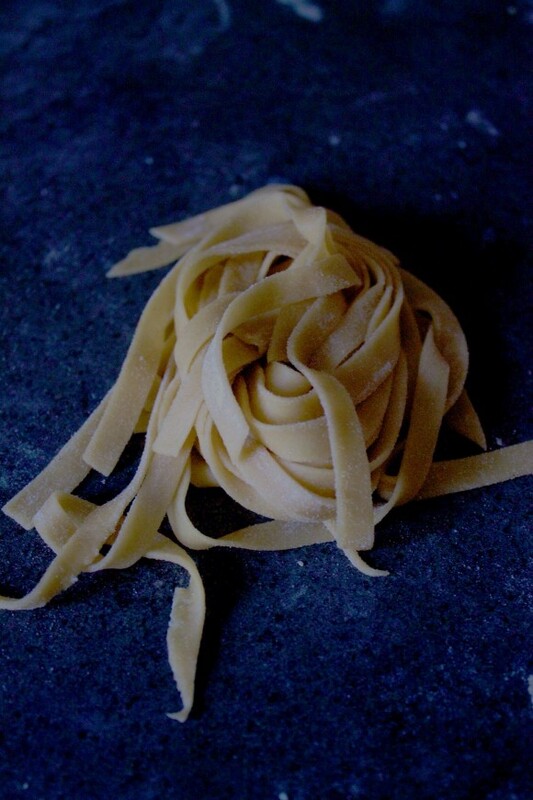 The only thing you really need is a pasta machine, to roll out the thin sheets of dough. I suggest looking at a Homegoods or Marshalls. I've seen them there for under $30 (its an investment that will last a life time). I have somewhat struggled with dough recipes in the past - especially when I play around with the type of flour I use. I specifically had a bag of whole wheat flour, so I ran a search on the interent for a recipe calling for the same. My first hit was for a recipe by Lidia Bastianch. I didn't need to look any further; Lidia is a goddess in the Italian culinary world. If there was anyone who had a good recipe for pasta, then she did. I had just walked in the door on Tuesday, after picking up the farm share. I ran to my Kitchen Aid mixer, pulled the recipe up on my iPhone and started measuring out my ingredients. As I opened my whole wheat flour I was pleasantly surprised to see my 1-cup measuring cup that had been missing for several months. It was a good omen. Flour, salt, olive oil and egg. How much simpler does it get? In just a few minutes I had pasta dough ready to work with. I wanted the recipe to be simple and focused on one key ingredient: the asparagus. Before cooking my pasta (which would only take about 2 minutes being so fresh), I used the pot of boiling water to steam half of the bunch of asparagus for a few minutes, and then put in an ice bath to retain its bright green color. For the sauce, I started melting 2 tablespoons of organic pastuered salted butter in a saute pan. I added sage and a squeeze of fresh lemon juice to add some brightness to the dish. Meanwhile, I took a small handful of hazelnuts and toasted them in the oven. It wasnt a necessary step, but I like the deeper flavor it adds than just using raw nuts. I mentioned this was a simple recipe, but you have to be a good multi-tasker as everything happens so quickly. Hazelnuts were toasting, butter was melting, and the aspargus was steamed and ready. All there was left to do was through in my fresh linguini into a bot of boiling salted water. Two minutes later, I pulled the pasta, add added to the pan of melted butter along with diced asparagus. Tossing the pasta in the pan of sauce allows the pasta to continue to absorb some of the flavors, while warming up the asparagus that was cooked in advance. I split the pasta over two bowls and topped with fresh cracked pepper, shaved pecorio romano, and chopped toasted hazelnuts for myself. Fill up pot used for cooking pasta, halfway. Using a steaming basket, steam asparagus for 3 minutes. Remove from heat and put in ice bath to retain bright green color. Add more water to pot, full enough to cook pasta. Maintaining a food blog is a lot of work, especially on top of having a busy job. There is quite a lot going on at work, and even though most of the Irish-inspired recipes I planned out for this week are rather simple, it still takes some time to prep everything and have daylight to shoot it all. Thankfully I had a really quick and easy recipe for Garlic & Herb Dublin Bay Prawn planned out to recreate. Fishing towns are scattered all throughout Ireland's coast so I'm dedicating several of this weeks posts to seafood. Dublin Bay Prawns, also commonly known as langoustine, are very similar to look and taste to shrimp. Prawn and shrimp are in the same zoological class but prawn are generally a bit larger. For whatever reason prawn/langoustine are not common in the states. In fact, I think the first time I had seen a langoustine was when my husband and I were honeymooning in Portugal. Short story long, instead of using Dublin Bay prawn, I picked up a half pound of shrimp. For the best flavor I could have purchased them with shells (they flavor the sauce), but to keep it simple I grabbed the peeled and deveined. How it all comes together The longest thing you need to wait for is the water to boil for the pasta. Other than that, be ready to move quick. While that pot of water is coming to a boil, start prepping your shrimp. Rinse off and pat dry. In a bowl mix the lemon juice, minced garlic, herbs and the 2 tbs of soften butter in a bowl. Add the shrimp and massage the butter/herb mixture into the shrimp. Do not leave in this marinade for longer than 30 minutes because the acidity of the lemon will cook the shrimp before it even hits a sauté pan. When the water looks close to a boil, get a sauté pan set over medium heat. (Here is where you need to move fast). Drop the shrimp with marinate into pan and start to sauté. They only need 1-2 minutes per side. Now drop your angel hair into the boiling water. Check the instructions to cook until al Dente (a slight bite). Once shrimp has color on both sides, add about 1/4-1/2 cup of white wine to the pan and let reduce for a minute. Drain the pasta and add to the saute pan. Let cook in pan for another minute. The pasta will soak up all those flavors. Divide to among two bowls and top with a few fresh herbs. Ideally enjoy with a glass of white wine, especially if you've had a long day. My anticipation for Spring is at it's highest now that daylight savings has arrived. I'm so looking forward to longer days, warmer weather and the fresh flavors the season has to bring. It's all worth celebrating and St Patick's Day couldn't come at a better time. I, myself, am not Irish, but I've married into an Irish family. Now, as a Turner, I think its important to learn a few things about it. Food is one of the best ways to immerse yourself into a culture and what better time to explore Irish cuisine than the week of St Patrick's Day! So what exactly is Irish cuisine? Even when you look at the menus of "authentic" Irish pubs around Boston, I see "quesadillas" and "chicken Parmesan" as often as Shepard's Pie. It's certainly not "Irish" just because it has Guinness or whiskey (although a the Chocolate Guinness cupcakes I made last year were some of the best I've made). And surely, there is more to Irish food than Corned Beef and Cabbage and Bangers and Mash (which I love). 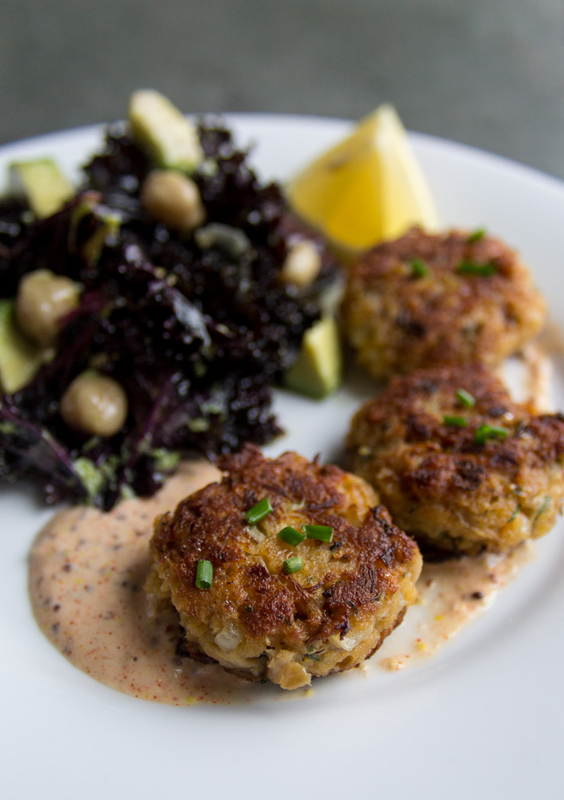 This first recipe I'm sharing is all about simple, fresh, and "local" ingredients. The whole meal came together in about a half an hour (fresh baked bread included! )So let's get to it. Irish Soda Bread is a considered a classic. If you are planning on making any Irish meals this week, I beg you to try your hand at making your own bread instead of buying a pre-made loaf (or even worse, a "mix"). Irish Soda bread requires 4 ingredients and chances are you have 3 of them in your pantry already. All you need to buy at the grocery store is buttermilk. I would have love to get some fresh buttermilk from the local farmer's market, but I didn't see any so I opted for some organic milk at the grocery store. The only thing adding flavor to this bread is the buttermilk, so it was important to me to get some higher quality milk (hormone/antibiotic free). Preheat the oven to 400 and get ready to get your hands dirty. You will be glad you didn't dig out your mixer (one less thing to clean). Get your biggest bowl and fill it with the flour, salt and baking powder. Mix to combine. Then make a well in the middle of the flour to pour the buttermilk into. Then, as seen, slowly pour in the buttermilk into the well. Then, using one (clean) hand, slowly start mixing the flour into the buttermilk. The dough will come together very quickly. It will feel sticky, but shouldn't feel wet. Once mixed, knead a few times. The dough should feel pillow-y. In this shot, I was testing out a stone ground flour. I've made this recipe before with traditional all purpose flour, and I could tell be the texture the mix just wasn't right. The flour is much more course and I have a feeling the stone ground flour was much heavier, per cup, than the ap flour. No worries, even with a little blunder, it took 5 minutes to start from scratch and get it right. For the heck of it I decided to bake both. The stone ground came out way too dry. I learned the hard way your can't replace alternative flours cup for cup. Before popping in the oven, use a sharp knife to cut an "X" on the top and brush with a bit of olive oil or buttermilk for color. Bake for 25-30 minutes. At this point you are 30 minutes away from a delicious Irish meal! Crack a beer and kill some time (the mussels only will take 10 minutes). Seafood goes far beyond Fish & Chips - you have Dublin prawn, salmon, cod, mussels and more! The market had some great looking Maine mussels harvested the day before so I knew I wanted to put together a dish around them. I had seen a Guinness inspired dish online I wanted to try to recreate. The first thing you must do when you get home is to place the mussels in a large bowl of cold water. Add in a few tablespoons of cornmeal. This will help clean the mussels. Essentially, as they eat the corn meal, they get rid of the sand and other stuff that already was in their stomach (yuk, I know). Set them in the fridge (in water) until ready to cook. A great mussel dish needs a great broth, and a great broth needs great flavors. 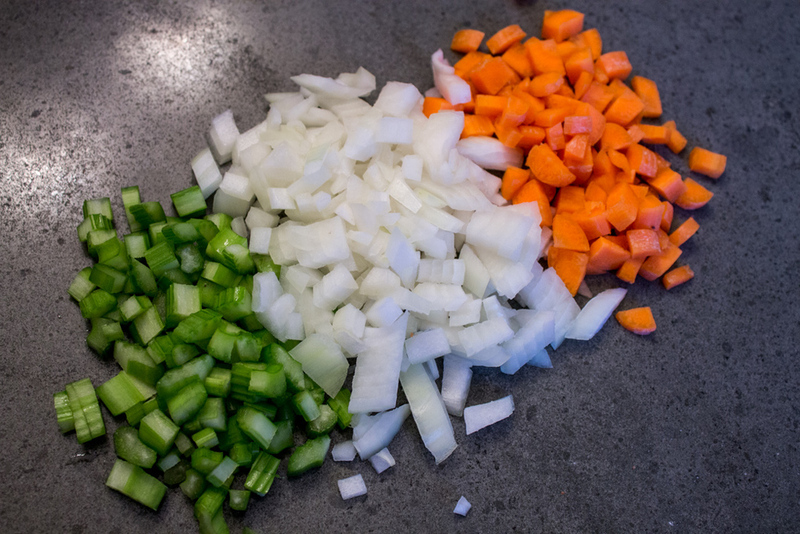 This one starts off with a classic mirepoix of carrots, onions and celery (ironically in the colors of the Irish flag). Get a deep dished sauté pan set over medium heat. Add a tablespoon of butter (I used Kerrygold). Add the finely diced veggies and begin to sauté for 3-4 minutes. You don't want to burn/caramelize them, just slowly sweat them. Get ready for the good stuff. Pour in a bottle of Guinness along with a 1/2 cup of chicken or fish stock to deglaze the pan. Add a bay leaf and turn up the heat to bring to a simmer and let reduce by half. Turn down the heat a little and add the half cup of cream. You want to let that simmer and reduce by half again, but need to watch closely that you don't scald the milk. Be sure not to have the heat up too high. Now you can add your cleaned, rinsed mussels to the pot. Cover and let steam for 3-4 minutes. The mussels are ready when they open. If they are a few that didn't open, remove and discard. Those were dead before you cooked them so do not try to eat them! I love serving this family style and let everyone serve themselves. By now, the Irish Soda bread would have plenty of time to cool. Cut several slices and serve with softened Kerrygold butter. The bread is perfect for sopping up all that delicious creamy Guinness broth. As you would pair a nice red wine with a Cog-Au-Vin, it would only seem right to enjoy a pint of cold Guinness along side the Guinness Mussels. That is just how my husband and I had this dinner. I have to admit, there is something really special and romantic about a meal like this. It really amazes me how a few simple, good quality ingredients can come together to make something so delicious. I love cooking in the winter. As the days get colder and shorter, and I start craving warming comfort food, the kitchen becomes a haven. Usually the stovetop is slowly simmering marinara sauces and stews and the oven is cranking out delicious sugary baked goods. A year ago today, I was (at least) 23 lbs heavier. As we head into the holiday and colder blistery New England winter, I'm determined to find new healthy favorites that are just as comforting as the heavy dishes I used to devour. 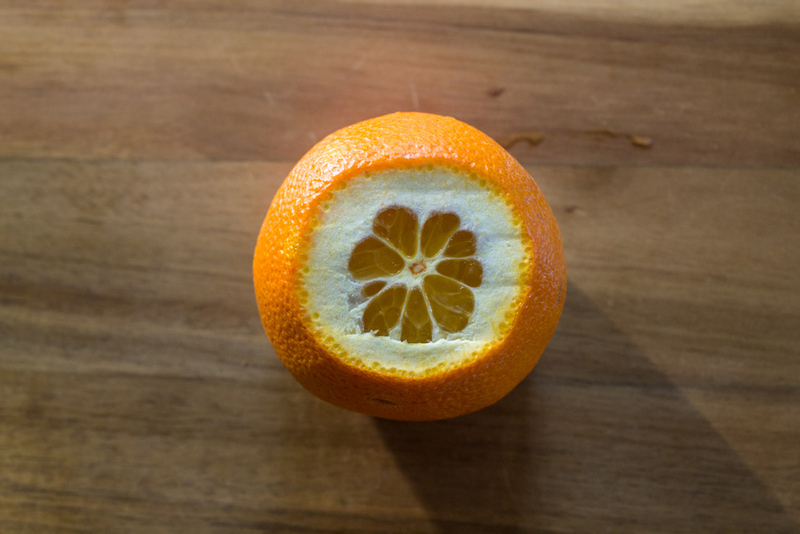 I look to seasonal produce to help inspire me. Italian dishes are undoubtedly comfort food to me, but pasta certainly isn't on my go-to "healthy" list. Luckily, high carb and calorie pasta can be easily substituted with spaghetti squash. Spaghetti Squash is considered a winter squash. They can be identified by their tough skins as opposed to summer varieties like zucchini. Like butternut, acorn, kabocha, pumpkin, and delicata squashes, you should easily be able to find these at a grocery store this time of year. 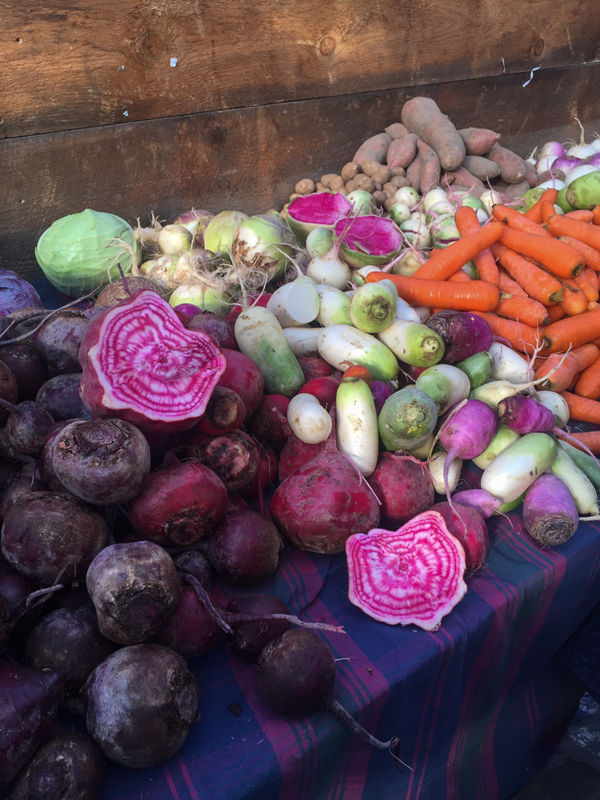 They also are featured in Winter Farmer's markets that pop up after the holidays. Spaghetti Squash gets its name for its resemblance to spaghetti pasta after its been roasted and the flesh removed. Its low in carbs and calories, and high in vitamins. A cup contains only 42 calories and 10 carbs so you could definitely go for seconds and thirds without feeling guilty! The stuff is just really delicious, if you haven't tried it, introduce yourself to it this week! I've made spaghetti squash with bolognese before, but this week I wanted to try something different, like a pesto. Traditional pesto is made with basil, garlic, Parmesan cheese, pine nuts and olive oil; and you can't really go wrong with that. While you can certainly find basil in the grocery store this time of year, its definitely more of a summer flavor. I made several variations of pesto this summer with a variety of greens from our farm share. Kale, being one of my favorite greens, and also in season, would make the perfect base! Out of pine nuts, I opted for raw, unsalted cashews I had. Everything else would remain the same. Roasted cherry tomatoes complete the dish as the acidity helps to cut through the richness of the pesto. They are just popped in the oven towards the end of the squash roasting and make a beautiful garnish. I love how they look like bright little rubies standing out against the green pesto. It's very Christmas-y! So here's how to whip this dish up. The first thing you have to do is roast the squash. Pre-heat your oven to 375°. Using a heavy kitchen knife, carefully cut the spaghetti squash down the middle and remove the seeds. Place cut side up, drizzle with a bit of olive oil and season with salt and pepper. Bake for around 45 minute or until fork tender. While the spaghetti squash is roasting, you can whip up your pesto. Add kale, cashews, garlic, a squeeze of lemon and Parmesan cheese in a food processor and pulse until everything has broken down in tiny bits. Then, slowly drizzle your olive oil in, blending until smooth. Use a spatula to scape everything out into a separate bowl. Next prepare the cherry tomato topping. Depending how much tomato you like, slice a handful or so of cherry tomatoes in half. Toss with olive oil, salt, pepper and fresh thyme. Place on a baking sheet lined with parchment paper for easier clean up. When the squash only has 20 mins left, pop the tomatoes in the oven to roast. One the squash is ready, everything will come together really fast. Pull the squash and tomatoes out of the oven and let cool so the squash is easier to handle. Using a fork, start scraping at the flesh and pull out the "spaghetti". All that should be left is the tough skin that can now be discarded. In a bowl, toss the spaghetti squash with half of the pesto. Save the rest for later use (you can freeze it) or add a bit more to the spaghetti squash. Just be mindful of the portions, between the oil, nuts and cheese there is a lot of calories and fat in pesto, luckily its mostly the healthy kind and your serving it with squash that virtually has none. Serve in two bowls and top each with the roasted cherry tomatoes. If you'd like, garnish with a few chopped cashews for extra crunch. Cut spaghetti squash in half the long way. Remove seeds. Meanwhile, add kale, cashews, garlic, Parmesan cheese and lemon juice into blender and pulse until kale and cashews are in tiny pieces. While pureeing, slowly add up to 1/2 cup olive oil, until pesto is smooth. Scrape into another bowl and reserve for later. Cut cherry tomatoes in half. Toss with a tablespoon of olive oil and season with salt, pepper and thyme. Place in oven the last 20 mins that the squash is cooking. When squash is done, let cool a few minutes before handling. Using a fork, scrape out all the "spaghetti" like flesh until only the tough skin is left. Toss half of the pesto in with the squash, and serve in two bowls. Top with roasted tomatoes and garnish with a few extra chopped cashews if you like.